Louis van Gaal says he may leave Manchester United at the end of his three-year contract to keep a "promise" to his wife. Asked about extending his contract at Old Trafford, the Dutchman told BBC Sport that he intended to "give it up" at the end of his contract in 2017. "I promised that to my wife. We have not many years together any more. That is the reason," said the 63-year-old. "I have done everything in my career as a manager." Asked about the possibility of extending his stay, Van Gaal said he could not answer because his wife, Truus, "is very mad". "I have to admit I have said to her, when I met her and our relationship seemed to be very good, that at 55 years I shall quit. I am still working and next week I am 64. "The only wish was the Premier League. Now I am here. "So. I have to go to Qatar to earn still more money? I don't think so. You have to enjoy also your life and your relationship with your wife." Van Gaal says Cristiano Ronaldo is the type of player Manchester United need to compete with their rivals. While the Dutchman would not be drawn on whether he thinks the Real Madrid star, 30, might return to United, he knows the Portuguese is regarded by United fans as the holy grail signing. "I can imagine that. He is a fantastic player, I like him," he said. When asked if he needed that kind of player to complete his squad, he said: "Of course." He added: "I can give examples of champions: Bayern Munich, Franck Ribery and Arjen Robben; Chelsea, Eden Hazard and Willian; Real Madrid, Cristiano Ronaldo and Gareth Bale; Barca, Neymar and Lionel Messi. Winger Angel Di Maria has been linked with a move to Paris St-Germain and did not join up with United for the start of their pre-season tour of the United States. Ronaldo is just 10 behind Spanish striker Raul's record of 323 goals in 741 for the Bernabeu side. Wayne Rooney was Manchester United's top scorer last season with 14 goals, but Van Gaal says that the 29-year-old must improve on that tally if he plays, as planned, as a single striker. Manchester City's Sergio Aguero scored 32 goals in 42 appearances for Manchester City last season. "He has to score the amount of goals that Aguero gets," said Van Gaal. "He is our striker. He has to prove he can do it but I have full confidence that he shall. "Rooney has said that he scores at the minimum 25 goals. So when I have a striker that scores 25, then I am better off." Rooney last scored more than 25 goals for his club in 2011-12 when he found the net 35 times for United. Former Manchester United manager Sir Alex Ferguson has been present on the US tour for the first time since his departure, but Van Gaal says that has not put added pressure on him. "I want to talk with him. 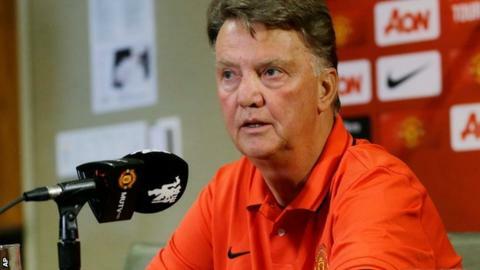 I talk with him very much times," said Van Gaal. "We eat together. He is sitting in the board, so he has to judge on me. I know that. But there is nobody in this world who can push me more than myself." Manchester United have signed defender Matteo Darmian, midfielders Bastian Schweinsteiger and Morgan Schneiderlin, forward Memphis Depay and goalkeeper Sergio Romero this summer, as well as selling Nani and Robin van Persie. But Van Gaal says the squad is still "not my Manchester United". "We at Manchester United buy only players who can contribute to our level," said the Dutchman. "You can write every player that you want, every name that you can say, but we cannot say that. It is also difficult to select the players because you need the players, the club and the money, so it is not as easy as you think. "I want more players but it is not always possible."